Quikker is a revolutionary new table game – based on a unique, individual new game called Quikker. The electronic multi-position Quikker game is unique to the market based on betting on possible combinations on two cards. The beauty of Quikker is that it a simple and quick game to play where the player has the possibility to win up to one hundred times of the stake placed. Quikker is also available as a live game. Thus, operators can offer their customers Quikker in electronic format or as a live game. at the same time. Add to this the wonderful design with the four large-screen monitors that both attract and inform players at the same time, then you have a recipe for success. The ‘Roulette Grand Jeu Double’ is completely designed and made in Austria. The robust table design of MultiPLAY HD Auto offers high quality gaming to all types of venue ranging from traditional casinos and electronic casinos to slot clubs and electronic arcades. It features TITO, with individual bill acceptors and ticket printers per player position and a fully cashless option featuring smart key technology is also available. The MultiPLAY system appeals to all levels of player but will also deliver casino operators increased profitability. All chip handling, calculation of winnings and pay out functions are fully automated by the system, delivering total game security, reducing costs and substantially increases games played per hour. When combined with a Saturn, Gemini wheel or the TCSJOHNHUXLEY Automatic Dice Recognition system to feed winning results to your existing electronic terminals, MultiPLAY is an exceptionally profitable form of live gaming. Earlier in 2012, TCSJOHNHUXLEY launched Tablet Roulette the perfect electronic gaming product for delivering increase player positions and generating more revenue with minimal staffing overheads and running costs. Tablets are very easy to use and are a familiar technology to consumers now that smart phones and tablets devices such as Apple iPads are in common use. Tablet Roulette is a server based solution offering live and automated Roulette via hand held tablet devices in a live casino environment. It is the perfect live game solution for use in what have traditionally been nongaming areas such as bars, restaurants, and smoking terraces. It enhances a casinos electronic revenue by giving flexibility during busy periods, offering increased player positions without the need for additional staffing levels. Ideal for servicing the demands of a casino during peak visitor periods the system can be used to reach out to social visitors that are using bars and restaurants allowing them direct access to playing live games broadcast from the gaming floor. Tablet Roulette gives casinos the ability to greatly increase the number of player positions they can offer during busy periods such as weekends and public holidays without any large scale investment which is then unused at quiet times such as during the mid-week and daytime. These new player positions will not demand expensive staffing resources, only using staff that are already working behind the cash desktop to issue the devices, with further fully automated player interaction across the venue via self service top-up kiosks. 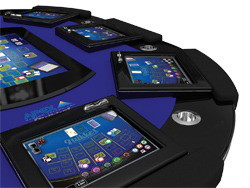 All this makes Tablet Roulette a unique gaming product that will deliver maximum flexibility and help drive new revenue streams without the risk of ramping-up costly staff and resources such as further table equipment. Slovenia-based Alfastreet has been a major player in a world of Multiplayers for over 17 years. What started as a home based, small workshop, has become a leading Multiplayer brand with thousands of products placed all around the world. Today, Alfastreet is still a family owned company, which with the help of a dedicated team, leads the way and makes the Multiplayer market an interesting, a progressive and a competitive place. Of the wide range of products coming out of Alfastreet, the all-time best seller is the roulette. For years Alfastreet’s major product was a R8 roulette, an eight-seater with an automated wheel in the middle. This product changed the market and made multiplayers what they are today. R8 roulettes were a ‘must have’ product with revenues going through the roof for operators. Today, the R8s are slowly saying goodbye, leaving their space to more sophisticated equipment, with more features, but most importantly, more games to choose from. A worthy replacement for Alfastreet’s R8 is the company’s R1SL M3 single terminal. When several units are combined, and connected to a game of your choice, this terminal becomes a part of a perfect combination which we now call a multiplayer. Alfastreet offers wide variety of games to be connected to such multiplayer, starting with roulette, sic bo, bingo, poker, black jack, baccarat, horse racing – and more are coming. With a great variety of games and perfectly fitted terminals, the R1SL M3 assures Alfastreet a long and bright future. With these terminals, Alfastreet has conquered the Asian market, and is now focussing on the Americas, Africa and Europe. Numerous installations, especially in South America and the USA, show that Alfastreet has found a recipe for the perfect multiplayer, and now just needs to give a taste to the remaining operators who are not familiar with this famous brand. The DTS-A is a combination of DigiDeal’s DTS-X and DTS-V platforms and is loaded with new features that make game play more efficient and convenient for casino operators and more fun for players. The new 5-player platform allows operators to switch between multiple game themes and fits in the same compact footprint of a standard BlackJack table. Each player position features a 15” touch screen and is equipped with multiple language options and its own bill validator, ticket printer, and individual player tracking. The DTS-A has a large host screen in the center that allows better visibility for players. The DTS-A can be configured to use a live host or can be fully automated with no host at all. It also interfaces with outputs from live casino elements such as real cards from a smart shoe or a roulette wheel. The revolutionary three active wheels that offer multiple gaming options and increased chances of winning is the main inovation that Triple Crown roulette brings. The significant difference between the Triple Crown and other electronic roulettes lies in the three active wheels that offer player the additional gaming options, multiplied winnings, and consequently, the adrenaline rush and excitement. The unique combination of card games and roulette in “Triple Crown wheel of fortune” and “Triple Crown Poker” is the real challenge for players. The leading idea of Triple Crown electronic roulette is aimed at improving typical visual image of every casino, providing a complete satisfaction for both players and owners at the same time. Additionally, the futuristic canopy with LCD’s above the roulete offer complete statistics and all necessary data for players. Besides the original design, the main benefit of Triple Crown electronic roulettes with three active wheels is extended offer of unique games and possibility of playing either a three wheels or a classic single wheel game. Triple Crown roulettes represent a new and innovative solution because initially lower margin turns highly profitable, due to significantly increased speed and new gaming options. These features combined with attractive design and high quality components – make Triple Crown roulettes the right choice for all operators that follow the world’s trends. The G4 Organic family of gaming devices consists of electromechanical, virtual and live tables with electronic betting. Interblock’s G4 Organic Virtual is revolutionizing what is one of the industry’s most popular games. The innovative G4 Organic Virtual with new possibility of a Side bet has been a huge hit with many customers worldwide who are looking to provide an environment that meets the needs of today’s tech-savvy players who are incredibly comfortable in this type of computerized playing environment. Organic Virtual is the most attractive video table product on the market with two basic versions available for playing with Roulette or Card games. Virtual generators are totally independent and automated as they do not require any human assistance when simulating traditional table games. Organic Virtual generators are very popular in the gaming industry, as virtual or video simulation of results generation, irrespective of the form and type of game, is not linked to the default return percentage, which means that the display of a result of an individual game is purely random and not predetermined, which is the case in independent gaming machines featuring the same games. Organic Virtual with additional Side bet game is Interblock’s new feature. With the Side Bet, the casinos have the option of collecting more revenue as additional bets are introduced in the game. For Blackjack game, the goal of Side Bet is to collect one to four Aces in a single game. The amount of win is increased with the amount of Aces that the player has collected. We have several different pay tables prepared for casinos and in the future we’ll also offer multi-level progressive winnings. Side Bet is available on all our Organic Card Automated, Live and Virtual Products. In the mid-90s, at a time when the numbers of players at live-tables were deteriorating to an all-time low, AGI pioneered a gaming product that combined the best of both slot and live table play: the first electronic live-gaming multiplayer product, Novo TouchBet Live-Roulette. The concept became an instantly successful phenomenon and created a whole new trend in gaming entertainment. Since then, the Novomatic multiplayer product family has been expanded and the enhanced game range has attracted significant international success in casinos all around the world. Today’s Novomatic electronic live games are based on the innovative NOVO LINE Novo Unity II platform. The unique feature of the NOVO LINE Novo Unity II system is the flexible interconnection of a great variety of electronic live games and slot games on a virtually unlimited number of individual player stations. This multi-game functionality allows the operator to link any chosen number of terminals to different games such as Roulette, Baccarat, Bingo, Black Jack, Poker and Sic Bo as well as a great slot games offering all within one installation. The latest additions to Novomatic’s great range of electronic live games are the Novo Multi-Black Jack and Novo Multi-Baccarat, both of them employing TCSJohnHuxley’s innovative Infinity Auto Dealer – a revolutionary utility device that offers continuous, fully automated, real-time, card shuffling and dealing using standard casino playing cards. Another innovation in the world of electronic live games is an amazing unique variation of the traditional game of Roulette with odds up to 1,200 : 1! Novo TouchBet Live-Roulette Double Action and Novo Flying Roulette Double Action deliver two winning numbers from one single spin of the wheel. TCSJohnHuxley’s special Double Action Roulette Wheel features two counter-rotating number rings, each with a traditional set of numbers situated in opposing order. Each spin of the wheel generates two winning numbers: one on the inner ring and one on the outer ring. Popular cabinets such as the Novo-Bar (available in slant top or bar top configuration) or the NOVOSTAR SL1 slant top cabinet have a perfect ergonomic fit and display the game ideally for maximum player experience.